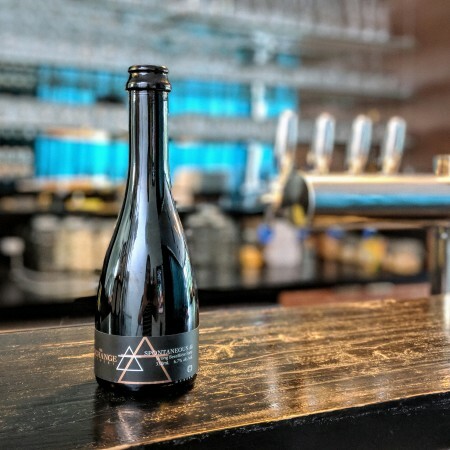 NIAGARA-ON-THE-LAKE, ON – The Exchange Brewery has announced the release of a limited edition beer that has been almost three years in the making. Unique in Ontario, our Spontaneous Ale was brewed with traditional turbid mashing techniques followed by an extended boil of noble aged hops. This barrel-fermented ale was inoculated with wild yeast cultures harvested from fruit skins growing in Niagara and using cultures from our own ‘mini-coolship’ experiments – illustrated by the air symbol on the bottle’s label. Spontaneous Ale will be available in a limited run of 330 ml bottles exclusively at The Exchange Brewery this Saturday September 8th at 10:00 AM. Less than 1000 bottles will be available, with 100 being sold in a package with a branded flute glass for $28, and the remaining bottles retailing for $16, while supplies last.